Our custom Interior Designers work with you to create a finished look that matches your home and budget. We want to work with you - sharing ideas that best meet your needs. We want to assist you in giving your home that personal touch to meet your lifestyle. It's easy - we offer FREE in-home consultation, precision measurements, and the final installation. Our work and products are guaranteed as well. Please call today to schedule your appointment. Our prices are competitive plus we offer a variety of products in all sizes and made to order. 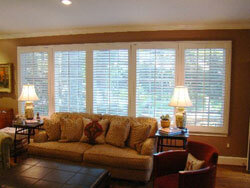 We are the source that Michigan depends on for interior wood shutters, blinds and shades.